At Mobile World Congress, the world’s largest gathering of the mobile industry, Reliance Jio stands out by having none of the specialized 2G and 3G infrastructure that long distinguished cellular carriers. Almost all mobile operators still have circuit-switched network gear in addition to IP systems. It came along with the 2G and 3G networks the carriers used before adopting LTE. Most are likely to keep older networks running for years, though some are moving faster than others to clear the decks. The move to packet-based networks is helping many carriers move to software-defined networking and virtualized network functions, which are designed to make it easier to start up and modify services. Going all-IP saves the cost of operating two different kinds of infrastructure. The Indian conglomerate Reliance Industries launched Reliance Jio from scratch just four years ago and quickly built a nationwide LTE network. Cisco Systems, which supplied much of the back-end infrastructure, presented Reliance Jio at a press briefing Tuesday to wave the flag for IP-based mobile networks. Reliance’s growth has been rapid, doubtless helped by the fact that its voice and data have been free so far. The company pulled in about 100 million subscribers in its first 170 days, a milestone it marked last week. At its peak, Reliance was signing up 1.8 million customers per day, said Mathew Oommen, president of network, global strategy and service development. That comes out to about seven per second. Reliance is offering free voice and data for its first six months, an arrangement that is expected to end soon. It remains to be seen how many subscribers will stay after the company starts charging. Already, the company's strategy is changing the dynamics of India's mobile industry. Next, Reliance plans to offer enterprise services. Oommen didn’t discuss any pricing models. But the scale and anticipated growth of the network are impressive. It’s now carrying about 34 petabytes of data per day, Oommen said. It’s also carrying 2 billion minutes of VoLTE (voice over LTE) calls. That’s good news for Cisco, because Reliance has about 150,000 routers now and expects to double its router and RAN (radio access network) capacity in the next six to eight months. 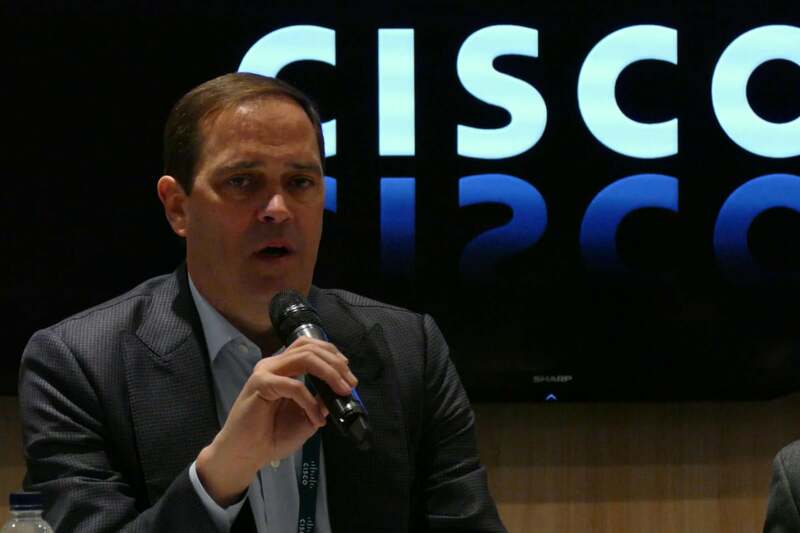 The key to making that kind of growth possible is software-defined automation, said Cisco CEO Chuck Robbins. But there are limits to what software can do, he said. Growing volumes of network traffic will require some dedicated, high-performance networking hardware rather than just the commodity gear that open-networking supporters advocate. “Software-defined networking does not obviate the need for hardware,” Robbins said. Virtualization and shutdown of legacy networks are hot topics in mobile these days. On Monday, T-Mobile USA Chief Technology Officer Neville Ray said he doesn’t want to be running 2G and 3G networks when he starts deploying 5G, probably around 2020. T-Mobile has also moved aggressively into VoLTE, so about two-thirds of its call volume is now packetized voice. AT&T, a strong early proponent of software-defined networking, is promoting its own virtualized network OS as open source and recently decommissioned its 2G infrastructure.